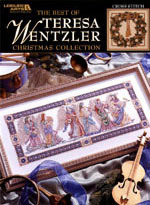 Description: This soft-back book contains 10 of my Christmas/Winter designs: Angel Procession, Winter Faerie, Companions, Winter Carousel Horse, Gabriel, Byzantine Ornaments (a.k.a. Stained Glass Ornaments), Father Winter, Nativity, Christmas Wreath, and Angel of Frost. Background Information: Most of my Christmas/Winter/religious designs are included in this book. Most of the charts are computer-generated. The book features beautifully-styled color photographs, and some background information about each design. © 2000-2013, Teresa Wentzler. All images and information on this website are owned and copyrighted by Teresa Wentzler, PO Box 176, Montoursville, PA 17754, USA. All rights reserved.